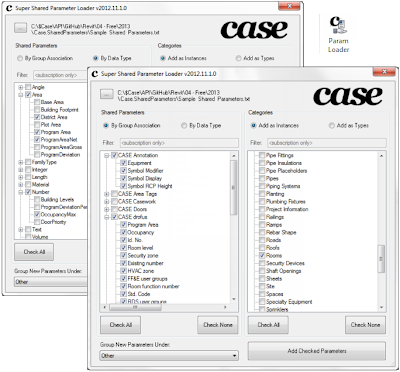 "The stock parameter loader is a huge pain for many users and offers very little power when dealing with large sets of parameters. This tool allows you to load multiple parameters at once. You can also visualize the parameters in their group associations as well as their data types. The CASE subscription version for this tool supports filtering as well as adding new parameters to the file from either parameters that exist in the current model or from user entry. Family parameters are only support by the subscription version. "Installation is handled from within the CASE Add-In Manager!"